A timeline of Lamar Public Library’s first 100 years! Without the donations of time and money for 100 years, Lamar, Colorado, would never have had, or kept, the quality library it has today—nor opened the new facility in 2004. Clubs, organizations, and individuals are responsible for many of the library’s purchases over the years, through their generosity. It is also the free labor of volunteers that has made so many of the library’s programs and fundraising events possible over the years. 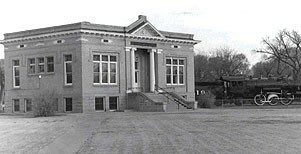 The Lamar Carnegie Library stood on a large lot where the new library and the municipal building are today. It was dedicated May 24, 1908 and was torn down in 1975 to make way for the new. December 17, 1906: The first written notice of the library is recorded. In the notes of the “Board of Trustees of the Town of Lamar,” Mayor Maxwell agreed to establish a public library. Prompted by a group of pioneer citizens, most notably C.C. Goodale, the people of the area banded together to form a real library. Before this time, individuals lent books out of their homes, especially “Mrs. King’s daughters,” whose small lending library the new library board immediately set about acquiring. December 31, 1906: A library board is appointed by the mayor. February 11, 1907: Mr. Andrew Carnegie of New York agrees to donate $10,000 for the erection of a building.” The Board of Trustees of the Town of Lamar” authorizes $1,000 for its yearly operating budget (but no funds, unfortunately, to buy books). April 15, 1907: A parcel of land described as Lots 1-17 in block 51 of the Holmes and Parmenter addition to the town, is purchased by the Town of Lamar for $1; a portion of that land is immediately sold to the library board for its building site, also for $1. A one-mill tax passes for the purpose of supporting the library. Construction begins almost immediately on the building, dubbed Carnegie Library, in the center of a block of soon-to-be landscaped grounds known as City Park. General William Palmer of Colorado Springs sends plants from his own gardens, to beautify the library’s park. April 14, 1908: The “Rules of the Library” are adopted. A two-cent late fee is established. Fiction books are “let out” for seven days only. A subscription membership to the library costs ten cents (though many citizens gave up to $50—a month’s wages—to help). A maximum checkout of 28 books per patrons is set. The board vows to raise $1,000 for new books on their own. April 15, 1908: First day of business at the library. Maud Miller has been hired as the first librarian at a starting salary of $55 a month, plus an extra $10 for working Sundays. 1912: Maud Miller resigns as librarian and Kathleen Lawless, daughter of J.C. Lawless, a founding member of the library board, is hired. Miss Lawless had already served as Assistant Librarian. Another future librarian, Miss Josephine Silver, was already employed as well. July 11, 1912: Ruth Sherborne establishes a volunteer-run Story Hour at the Library. This tradition is still going strong at the library 90 years later. 1914: Miss Josephine Silver becomes Librarian, serving until 1953 when she retires after more than 40 years. In 1918, Miss Silver was finally granted a paid vacation, paid for by the library board. December 26, 1919: The library board petitions the city to pave Main Street in front of its building. July 23, 1923: C.C. Goodale, the founder of the library, retires from service with the Board of Directors. Mr. Goodale passes away 3 years later. February 1, 1924: The board considers installing a phone in the library. Apparently, they decided against it. April 26, 1930: The matter of decorating and installing shelving in the basement of the library is considered. October 1943: The library board must make a tough decision: should they rent a typewriter or buy their very own “Underwood demo-model” for $120. 1945: A mill levy of 10 mills for the annual cost of running the city begins. The library’s operating expenses are included in this tax. An annual sum of $4,106 is awarded to the library. Plans to open a “sinking” fund for building an addition onto the library are made, due to lack of space. Mr. Chuck Bowman is asked to research the options. 1947: Building and Loan stock is purchased to begin a building fund. 1950: The first public kindergarten in Lamar begins, in the library’s basement. Founded by the “mothers of young children,” generally known as the Clio Club, the first teachers were Mrs. Hazel Bruckner and Mrs. Lois Moor. The kindergarten continued until 1953. In 1954, the public school system took over. June 8, 1953: Miss Silver resigns as librarian. Miss Deborah Merrill, Secretary of the library board fills in as Interim Librarian for June with a Miss Margaret Main acting as Librarian in July and August, at a wage of $125 a month. Miss Lucille Anderson is offered the position in the fall, for $3,150 a year. December 1953: The library’s budget for 1954-55 hits $7,625 (with $1,000 for book purchases). Hours are 1:30-5:30 and 7-9, six days a week. April 1954: The library is closed for several days due to dust storms. Sealing the windows with plywood fails to keep out the dirt. August 26, 1955: 53 children complete the Summer Reading Program. In 2001, 47 years later, 2,500 children attend the 28 events of the library’s summer reading program. The library staff is recognized as “Team of the Quarter” for their efforts. January 15, 1957: A report of the stock in Lamar Building and Loan reaches a value of $1,800.62, after only 10 years! These funds were eventually used for a reading room and historical society quarters. 1964: Mrs. Dorothy Henry is hired as librarian, a position she held for 17 years. 1965: A first formal membership drive of the “Friends of the Library” is launched. Their activities over the years have included book sales, library benefit “dinners,” and bake sales. Even today this group pays for new shelving, equipment, and the Summer Reading Program. 1966: Ordinance 550 is passed, making it punishable by up to $300 and/or 90 days in jail for stealing, or failing to return, a book from Lamar Public Library. 1967: Plans for the building of a City Complex, with a connecting library “wing,” are brought before the board. November 13, 1970: Prowers County Commissioners decide to give a fourth of a mill tax levy for the support of the library’ bookmobile. March 1974: The Carnegie Library is emptied and demolition starts, after 67 years of service. The library moves to the basement of the Community Building until its new quarters are ready. September 19, 1976: The dedication ceremony for the new City Complex, housing the police, fire department, and several other administrative offices–as well as the library– takes place. Mrs. Dorothy Henry continues to preside over the new library, with the help of Mrs. Olive Hutchins, Assistant Librarian since 1971. Unfortunately, the new library proves inadequate within eight years, due to increased circulation and the space needs required by new technologies such as educational videos, book-on-tape, and computers. April 11, 1979: The library begins serving the vision-impaired with its “Talking Books” program. November 1981: Mrs. Henry resigns after a serious illness. Olive Hutchins, Assistant Librarian, fills in until new Library Director Jay Burnett is hired in June, 1982. November 1982: It is decided that the city’s Code Enforcement Officer will begin collecting overdue library books. This duty later falls to the Lamar Police Department. Today patrons who refuse to bring back books are turned over to a collection agency after three written notifications have been sent to them. February 1984: Librarian Jay Burnett lobbies for a share of lottery proceeds on the basis that reading is a “recreational” activity. He received $2,100 and wrote about this amazing accomplishment for the State Library. Unfortunately, lottery funds are no longer received by the library. November 19, 1984: The library board and City Administrator review several possible expansion proposals. Space and repair issues are the major concerns for the board. 1986: The Lamar Public Library gets its own bookmobile, The “Read Runner/Prowers County Book Express.” Since at least the 1950’s the library had given money to the Lower Arkansas Valley Bookmobile (now defunct) for services. August 8, 1987: Librarian Jay Burnett leaves. Assistant Librarian Pat Melgosa is Interim Director until new Librarian Cornel Thomas is hired in October. Thomas leaves in on April 27, 1990, with Pat Melgosa again serving as Interim Director. September 4, 1990: Ms. Susan Ooton becomes Library Director. January 1991: Director Susan Ooton stresses the need for expansion and repairs in her annual report. Capital improvement funds are approved for some repairs, but never actually released. An attempt is made to replace carpeting, until an asbestos abatement issue is discovered. January 1992: The north wall of library, due to leaky walls and windows, is found to be covered in mold. An extensive cleanup and new paint job is required. February 5, 1992: Lamar Public Library wins “Emerald of the Plains” award for its work with children. May 5, 1992: Electronic automation comes to the library and the old card file passes away. 30,000 books are bar-coded. July 1, 1992: The Colorado Library Card is introduced to Lamar Public Library. This service allows Colorado residents privileges at libraries throughout the state. October 1995: The library’s second bookmobile is launched, after the demise of the “Read Runner.” Mary Buchele is the bookmobile librarian. December 2000: Susan Ooton leaves Lamar Public for a new position in Canon City. Mary Buchele is Interim Director until a former library board member from the 1980’s, Rebecca Atkinson, is offered the job as director in April of 2001. May 2001: The library decides that it cannot apply for a free computer lab from the Gates Foundation because it lacks both the space and electrical capabilities needed. The City Council approves the release of funds for design plans for a new library. November 2001: Four computers, a printer, and server are received from the Bill and Melinda Gates Foundation. March 11, 2002: After City Council asks the citizens who support the new library expansion and remodeling project to produce “a show of support,” citizens form a committee to petition the council and campaign for the project. C.A.L.L. (Citizen Advocates for the Lamar Public Library) is officially formed on March 11th when the officers are selected. Kathy Wootten becomes its president. May 1, 2002: A Citizens’ Initiative Petition is received after many delays and much hard work involving two lawyers and a bonding agent. 396 signatures are needed to put the library’s cause on the ballot for the November 2002 City Elections. Out-of-town patrons circulate their own ‘advisory’ petition to let City Council know that they pay sales tax in Lamar and they support the library’s expansion plans, too. May 11, 2002: The library celebrates its 95th year of public service with a balloon launch—one or more balloons launched by a patron born in each year of the library’s existence. Mrs. Jewell Ragsdale, a former library staff member, launches the balloon for the year of her birth: 1907. November 5, 2002: Citizens of Lamar vote to pay for a remodeled and enlarged library. Numerous donations and grants are received to help fund the project, the largest being a grant from the Department of Local Affairs for $200,000. Planning for the new library begins in earnest. August 2004: The new Library opens. 2006: Monies left over from the remodeling of the library allow the new library director, Debbie Reynolds, to purchase new shelving and furniture. The new shelving placed in the Non-fiction and Adult Fiction areas creates additional space for books and other materials. Other items purchased include furniture and posters for the teen room, a computer cart for the Cultural Events Center, and several new items were also added to the Children’s area as well. December 2006: The Library celebrated 100 years of service with a party and many special guests. Colorado State Librarian Gene Hainer read “The Polar Express” to an audience of adults and children with several local area government officials in attendance. The mayor of the City of Lamar, Nelva Heath, joined the festivities and helped with the dedication of two plaques to honor special donations given to the library. Previous director, Rebecca Atkinson, was honored for her work on the library remodel and grounds with a plaque (Rebecca’s Garden) placed over the flowerbeds outside the library. While a special stone was dedicated to remember the generous donation of a flagpole and bench to honor the 100th anniversary of the library by Dr. Daniel Tyler and his son Nicholas of Steamboat Springs. As they drove through Lamar in car #13 during the Great Race on July 1, 2006, they were impressed by the friendly citizens of Lamar and wanted to give the city and its citizens a visible reminder to mark this special occasion. Other festivities throughout the day included recognizing Mrs. Lynn Lefferdink and Jeffrey Hernandez as representatives of all the patrons who have used the library in its 100 years of service to the community. Tours of the library offered by staff and a special concert by the Arkansas Valley Jazz Ensemble were part of the 100 year celebration.